You could call them essays, or you could call them refrains, as this Irish born author does. In the introduction to her forty mini chapters on a sylvan theme, she recalls the traditional visits of the storyteller, and the way in which this ‘living memory bank of his race’, broached his subject. What he did orally, she emulates in writing. It’s an effective format when presenting pithy and sometimes radical conclusions. Much of the information in these ‘refrains’ may be worth remembering. For example, if a rattlesnake bites you, it might be handy to know that the Coneflower, often growing nearby, is the antidote to the venom of eight different species of rattler. Or that Black Walnut may be able to protect against diabetes, and that green walnut contains biochemicals that may help protect against childhood leukemia. The self-proclaimed ‘renegade scientist’ combines Western medicine and botany with aboriginal healing. Science has yet to put the stamp of approval on much of her work, however, as very few studies have been undertaken. A Canadian botanist, researcher, and lecturer specializing in the beneficial properties of trees, and the author of two previous publications: Arboretum America and A Garden for Life, Beresford-Kroeger lives on her 160-acre Ontario Eden. 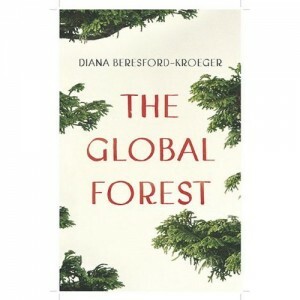 It may well be the first bioplan; the growing of indigenous trees is The Global Forest’s call to action. The interesting details and the tone of optimism make this more than just another book on impeding ecological disaster. By drawing on mythology and spirituality, she broadens the book’s scope while reminding us that nature knows best. Nuggets like the fact that there are 14,000 lichens in the world and that some like to live in skulls, are interesting enough. Do we need the personification? Ornithologist Stuchbury, author of The Bird Detective, has been successful in making a complicated study accessible to all, through humanizing birds with humor, and mixing personal observations with statistics, but I find the style forced in The Global Forest, partially because it’s harder to visualize mosses masturbating, and lichens practicing bigamy, and partially because there’s just too much of it. There’s a danger of trivializing the seriousness of the content, and diluting the message.